Pricing will be provided only after inspection or requirement collection wherever rates are not mentioned. TeleVision(T.V) has become an important part of our lives and we cannot imagine a day without watching TV. Any kind of obstruction can be problematic for you. Here’s when Har Ghar Sewa comes to your rescue. 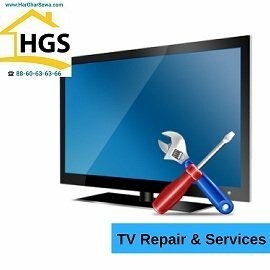 We provide you our best and experienced technicians for your TV repairment. Be it your home, office or any other place and be it a Plasma TV or LED/LCD or any other TV set we have our staff to help you out. The technician will come and inspect thoroughly your TV and see where the problem lies. Cost will depend on the work to be done and will be told only after the inspection. Why Har Ghar Sewa? You get proffessional and experienced staff to provide you the service. To ensure that there are no frauds, our service providers will have an i-card of Har Ghar Sewa and a standard tool kit with them. We give you the service at our best possible rates. Har Ghar Sewa have taken care of the payment as a response to the complaint. Good thing my TV issue get resolved. Thanks !! I'm very happy with the Har Ghar Sewa TV service. It was great experience with Har Ghar Sewa Tv service. Thanks. Very good TV services. Job was done very smoothly and without any instructions. I will suggest to more for LED tv services from Har Ghar Sewa.